I absolutely love my Kindle, but it doesn’t come with any sort of protective case out of the box. I shopped around and priced some cases online, but anything that is both functional and fashionable is out of my price range. So on the weekend, I made one myself. 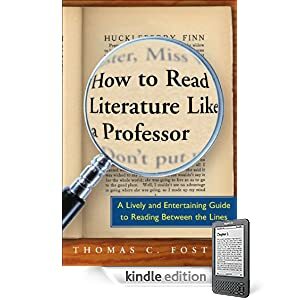 Thomas C. Foster’s How to Read Literature Like a Professor is the first book I downloaded when I bought my new Kindle a few weeks ago. Although I expected that I would probably be familiar with a lot of the content, since I’m well-versed in the analysis of literature, I was pleasantly surprised to find that I learned a few tips and tricks that I hadn’t previously considered. Foster writes clear, concise prose with a conversational tone. This book is geared towards readers that enjoy literature, but lack the formal education to analyze it to the full extent. However, Foster doesn’t speak down to his audience at any point in the text; he feels like the sort of professor who encourages you to stay and chat after class about the texts, because he’s excited about what he does. His style works very well in this regard, because although I don’t fit the target audience exactly, reading the book felt like an engaging and eye-opening discussion with someone who shares my passion, if not necessarily my opinions. I feel as if I’ve gained a great refresher, and broadened my knowledge base to boot. I would recommend Foster’s book for the novice and expert alike. I have a confession to make: I love audiobooks. I just spent the last hour poking around on Librivox.org, listening to fairy tales read aloud by devoted volunteers, and I was reminded of an argument I had earlier this year. I told one of my friends that I’d been listening to an audiobook version of the book we were studying in class, and he was horrified. He could see no reason to turn to an audiobook when I was capable of reading the text myself. The only excuses for their use that he could rationalise were listen while performing a relatively mindless task, like driving or exercising, or when vision prohibits reading. I readily agreed, of course, that these are wonderful reasons. However, I maintain they aren’t by any stretch of the imagination the *only* reasons to listen to audiobooks. While I admit that my first love will likely always be the strong physical sense of a paper book, audiobooks speak to a completely different sensual base. The form of books compliments their content with lush surfaces, evocative layouts and designs, tactile and olfactory sensations, and endless more endearing qualities that I can’t do justice to here, but until they are read aloud, much of the poetry is lost. The sound of the words adds a texture to the story that can be skimmed over during silent reading. When a text is read aloud, even if I read it to myself, I find that the rhythms and cadence of the prose take on a clearer meaning. Reading a book aloud to myself helps me to understand how I feel the author intends to be read. The emotional inflection that I expect may be different from what others ascribe to the text, and hearing someone else read their meaning into it can be very enlightening. Sometimes an audiobook gives me a fresh perspective on a text that I hadn’t considered in my own reading. Something as subtle as changing the pacing of a scene can throw unexpected insights into my analysis. The insights that an actor brings to their performance can invite responses fromthe audience that open up new facets to old arguments. On a basic social level, listening to someone read a story aloud reminds me of childhood. As children, we’re read aloud to a great deal. As we get older, we tend to lose most of that immediate sharing of a written text. There is something very intimate about reading together; it invites the participants to enjoy a communal emotional response, facilitating discussion among the audience. Public performance is a valuable aspect of creative culture, and belittling recorded audio performances of written texts denies them a deserved position in the tradition. There is a deep pleasure to be had in being read to, and a well crafted audiobook can perform the task in a very similar fashion. Honestly, I don’t think I’m being unreasonable here. But then again, anyone who can’t see the allure of Stephen Fry reading Harry Potter must be a hopeless case. The series was adapted into a film, and in the light of the release the remark above became an interesting and relevant jumping off point for a comparison, contrasting the manners in which time structuring is built and created across both media, through a careful analysis of the differences in function between shot editing in film and page layout in comics. The Victorian era marked a new interest in the Arthurian mythos, spurred on by a wider social interest in medievalism and Romanticism. The nearly canonical cycle of the Arthur story, Sir Thomas Malory’s Le Morte d’Arthur, was reprinted in 1816 for the first time in almost two hundred years; the newly republished legends inspired a new generation of authors, poets and artists including Alfred, Lord Tennyson (Pairns 8-10). Though Tennyson may have published his first Arthurian poem, “The Lady of Shalott”, before reading Malory’s text, his Lady is clearly based on a figure that appears in several of the Arthurian and Grail cycles, alternately known as Elaine of Astolat, the Demoiselle d’Escalot, Elaine the White, Elaine the Fair, and in the Italian romance Donna di Scalotta, which likely served directly as the basis for Tennyson’s poem (Potwin 238), the Damigella di Scalot. Tennyson continued to be fascinated by the Arthurian legends throughout his life and eventually produced Idylls of the King, a cycle of twelve narrative poems that retell the tales of Camelot, which was published between 1856 and 1885. His poems were influenced and inspired by the Arthurian and Grail cycles that came before his, however Tennyson’s work also contains elements that are without historical precedent in the stories that came before. In “The Lady of Shalott”, his inventions draw attention to the underlying themes of the poem; the literary Elaine, as she existed before Tennyson, was already said to have loved Lancelot with an unrequited passion that killed her and sent her bedecked body down the river by boat to Camelot, but there is no reference in any of the earlier texts to a tower, an island, a curse, a song, the Lady’s weaving, or a mirror. These elements are entirely the invention of Tennyson himself, suggesting that they are significant in understanding and examining the meaning intrinsic to the poem. The inclusions emphasize the geographic and emotional isolation of Tennyson’s heroine, as she is set apart from the world by her seclusion in a prison, isolated from society by a supernatural curse, and able to view the world only through a glass darkly. Her craftsmanship at the loom records life from an outside perspective; the expressive and emotional power of her songs creates a connection with the world outside her tower. Tennyson’s Lady is significantly removed from the world in which she lives, both geographically and emotionally or psychologically. In fact, it is difficult to describe her as living within the world at all; unlike the earlier versions of Elaine that precede her in the Arthurian literary tradition, Tennyson’s Lady is wholly unable to interact with society, because she is subject to a curse, and she instead lives a lonely existence in a tall gray tower above the bustle of life across the river. Tennyson devotes the first four stanzas of the poem, which make up the entirety of Part 1, to vibrant descriptions of the landscape of her isolation; amidst the lush, verdant countryside sits the “silent” Island of Shalott (l. 17), upon which the Lady is trapped by “[f]our gray walls, and four gray towers” (l. 15). The cold, stark imagery of the tower stands in stark contrast to the rich, organic descriptions of a world abundant and ready for harvest: “On either side the river lie / Long fields of barley and of rye, / That clothe the wold and meet the sky” (ll. 1-3). There is activity in the fields, but the world inside the tower and the world of the kingdom below exist separately and are unable to interact to any significant degree. The Lady is imprisoned in the tower, distanced from the world by the curse she has heard whispered is upon her (ll. 39-40). Unable to look upon the world outside her tower with her own eyes, she views only “[s]hadows” of its contents and inhabitants as they are reflected through the mirror behind her loom (l. 48), leaving her able to watch and interpret the actions of nature and society without the ability to participate. The curse has been suggested to represent “the inescapable condition of the poet’s art”, a sign of a deeper conflict between the internal world of the artist and the external world of society and social interaction (Culler 46). The artist struggles between her isolation during the creative process and a desire to participate in the day-to-day events of life with others. The distance between the artist and her subject is often emphasized by critics as being “removed from reality” several times (Hellstrom 13). The curse, therefore, has been said to doom the Lady “to produce an art object that is an inversion of a dim unreality” (Wright 287). However, Wright goes on to argue that this interpretation is fundamentally flawed, as the interpretations of reflection are exaggerated by some scholars. The mirror itself, rather than being a device solely present for the sake of the fairy tale, is necessitated by the task she performs; as her weaving has her working the back side of the image, the mirror allows her to see the front of her work, and is a common practice for weavers (287-8). The mirror’s function of reversal does not figure largely in the text; in fact, the theme of reflection that flows throughout the poem sees every significantly reversed image righted before it reaches the eyes of the Lady, through acts of double reflection. The sight of her beloved, Sir Lancelot, is both reversed and righted, as his image is reflected in the river and then righted again in the mirror: “From the bank and from the river / He flash’d into the crystal mirror” (ll. 105-6). With its function of reversal negated, the mirror serves only to divert the gaze of the Lady from settling directly on her subject and instead fixes it upon her work. By distancing her gaze from the world, Tennyson suggests that art is a solitary and introspective pursuit; in studying the reflections of the world outside her window, the Lady reflects on their beauty and strives to imitate and capture their beauty. Both songs wind through the natural world, eventually reaching the ears of others. Having been roused by the power of song, the Lady engages in a performance and signs her name to it, encouraging an appreciative response from others; with the curse upon her, she reaches out to the world around her in the most effective way the poet can: by projecting her voice into the world around her and attaching her name to the result.